Quick and easy apple tart recipe to impress your guests. 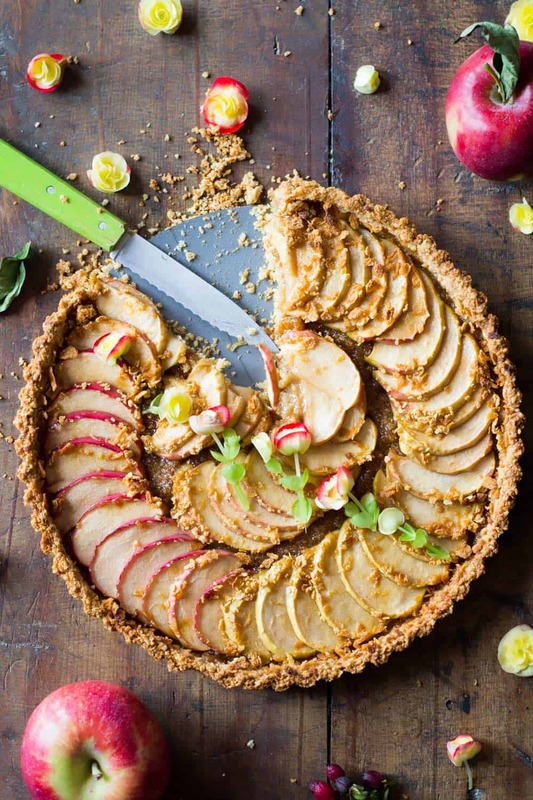 Delicious oat crust topped with sliced fresh apples and naturally sweetened. So first of all I want to talk about this amazing oatmeal pie crust. Oh boy oh boy! It’s crunchy and delicious and amazing times 20. If you use certified gluten-free oats you end up with a naturally gluten-free pie crust. 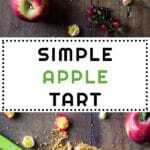 A naturally gluten-free Simple Apple Tart. The oatmeal pie crust can obviously be used for any kind of pie or tart you like. 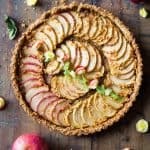 This pear tart for example is super popular on the blog and its crust can easily be exchanged by this oatmeal pie crust if you like. It has only 5 ingredients and all you need is a food processor, some wax paper and a rolling pin. I use wax paper to avoid the dough from sticking to the rolling pin. You can also use parchment paper. I simply recommend to use a non-stick flat piece of something to roll it out. Otherwise you would need more oat flour sprinkled on top and that makes the dough a bit dry. 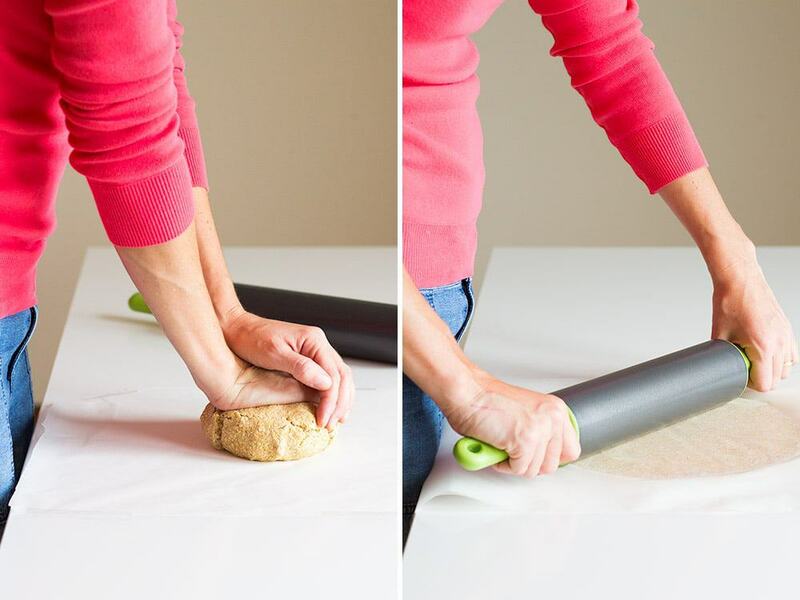 With wax paper you can easily roll out the dough without it sticking to anything but the wax paper itself which you can easily peel off once you are finished rolling. Peel off on one side, slide your hand under the bottom layer of wax paper and quickly flip over into your tart pan. Then press down the sides to cover everything. Remove the second layer of paper and then use your fingers to finish pressing into every corner and nook and tadaaa: an evenly thick oatmeal pie crust in your pan. 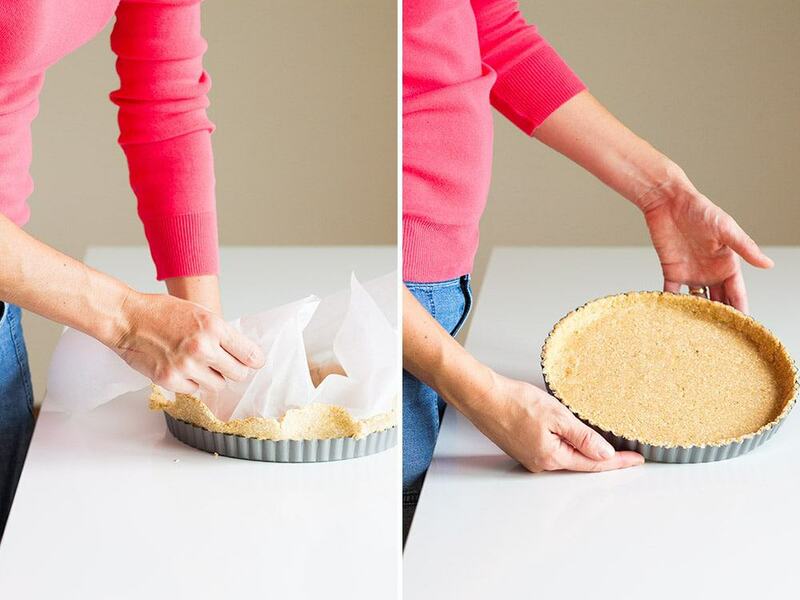 This method works well with any kind of pie crust to be honest. Which apples are best for a Simple Apple Tart? 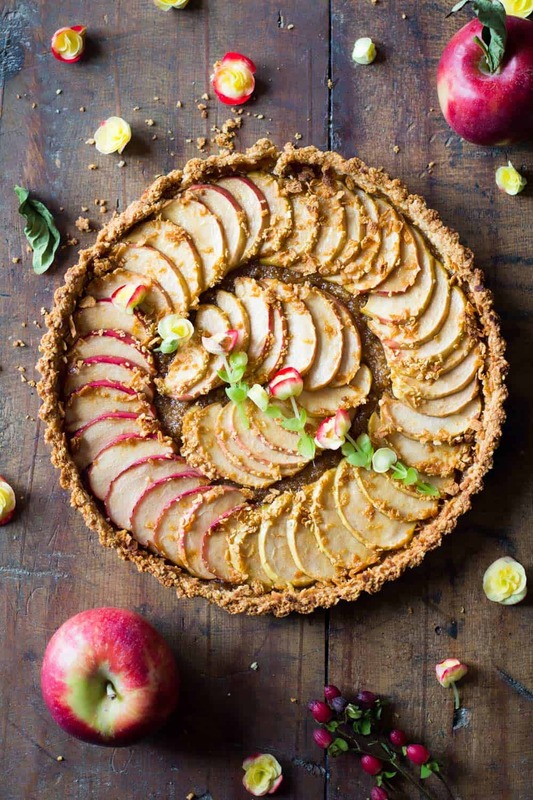 In theory you can use absolutely any apple you have on hand for apple tarts. Since this is a simple apple tart that contains only 3/4 cups coconut sugar and barely 30 minutes in the oven, I recommend a sweet kind of apple though. Granny Smiths are probably the worst apples for this. The tart would end up quite sour. Fuji, Cortland, Honeycrisp, Jonagold any of those are great. For the tart in the picture I used Mcintosh, which worked perfectly fine as well. Yes, for real! 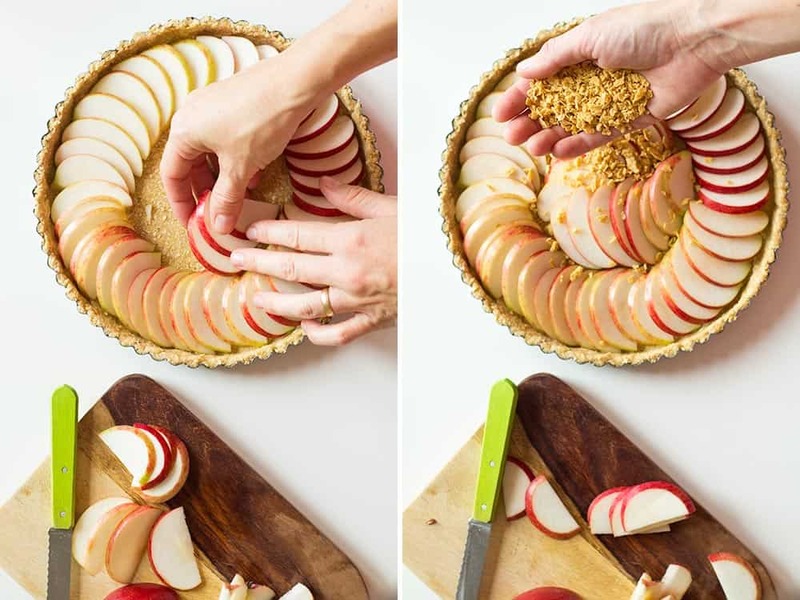 You are pretty much making an apple oatmeal breakfast in form of a tart. If your throw all the ingredients (except all the butter) into a jar and let is sit all night in the fridge you’d end up with a super healthy overnight oat breakfast. Now, of course, the oatmeal pie crust requires butter to become a “crust” but in my opinion butter is good for us. I know there are some that have a different opinion about this. Green Healthy Cooking, however, is all for healthy fats, just so you know. Process oats and sea salt in a food processor or high-speed blender until it reaches a grainy flour like consistency. Similar to coarse salt at the very least. Add cubed cold butter to processor and while processing add egg yolk, maple syrup and ice water. Cover the dough with another sheet of wax paper and roll out into a circle. Peel off wax paper from top and flip the dough over quickly into the tart pan. Peel off the other sheet and press the dough into the sides. Slice apples thinly (1/4" max) and arrange in a circle until all the bottom is covered. Spread maple flakes evenly on apple slices. Let cool completely before removing the from the tart pan or the sides will break.